This is the first mention of this mysterious event called the Abomination of Desolation. 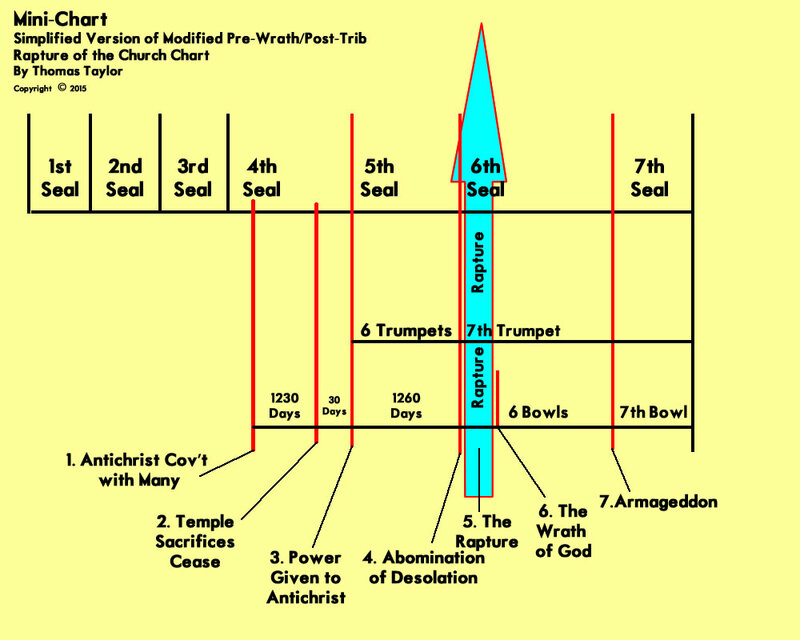 It says that the antichrist will confirm, or strengthen, a covenant for seven years. Is the Abomination of Desolation at the Same Time as the Sacrifice Cessation? There is clearly a separation from the time of the sacrifice ceasing and the Abomination of Desolation. Whatever the Abomination of Desolation is, it will be set up in the Jewish Temple. But it is absolutely clear that it happens 1290 days AFTER the cessation of the daily sacrifice. When does the sacrifice cease? Daniel 9:27, that we just read, said the sacrifices cease in the middle of the seven years (not the exact middle but approximate middle). So, if we read Scripture literally, it is impossible for the Abomination of Desolation to take place in the middle of the seven years. It must take place at the end of the seven years. ONLY the cessation of sacrifices takes place in the approximate middle of Daniel’s seventieth week. I am suggesting there is a gap of time between the phrase “he shall cause the sacrifice and the oblation to cease” and “and for the overspreading of abominations he shall make it desolate.” This gap is not arbitrarily added by me but by Daniel 12:11. Many people ignore Daniel 12:11 because it does not fit into their end-time scenario. Or if they choose to include it, they combine the ceasing of the sacrifice and the Abomination of Desolation into one event in the middle of the seven years. However, they terminate the 1290 days with…nothing! They do not know what it terminates with but it is right there in the verse. There is a cessation of the sacrifices then 1290 days later the time period terminates with the Abomination. It is crystal clear. This is one area apparently no one has challenged because it goes so contrary to today’s end-time teaching. It just does not fit in the manmade scenarios. However, are we to examine the Bible to find verses that back up our beliefs or are we to examine the Bible to find the Truth? As uncomfortable as this revelation is to our current eschatology, it is as plain as day. So let’s take this Truth and build our eschatology around it. Revelation 13:5 KJV And there was given unto him a mouth speaking great things and blasphemies; and power was given unto him to continue forty and two months. Daniel 12:7 KJV …it shall be for a time, times, and an half; and when he shall have accomplished to scatter the power of the holy people, all these things shall be finished. So at the midpoint of the seven years is also when the antichrist will accomplish to scatter the power of the holy people. This is the Great Tribulation. Just because there is no Abomination of Desolation in the middle of the seven years, does not mean there is no Great Tribulation. At the end of the Great Tribulation is when Armageddon takes place. Luke 21:20 KJV And when ye shall see Jerusalem compassed with armies, then know that the desolation thereof is nigh. Luke 21:20 even tells us when the Abomination of Desolation takes place. It is when Jerusalem is compassed by armies, which is at the battle of Armageddon. Almost all know that Armageddon is at the end of the seven years. So why does everyone ignore Luke 21? Again, because it does not fit the current manmade end-time scenarios. We cannot omit Luke 21 from our eschatology. It is in perfect harmony with Luke 17, Matthew 24, Mark 13, Daniel and Revelation. If we would accept this simple, however uncomfortable, Truth that the Abomination takes place at the end according to Daniel 12:11, then everything falls into place. Matthew 24:20-21 KJV But pray ye that your flight be not in the winter, neither on the sabbath day: (21) For then shall be great tribulation, such as was not since the beginning of the world to this time, no, nor ever shall be. At first glance this would seem to imply that the Great Tribulation happens after the Abomination of verse 15. But let’s look at this more closely. As Jesus continues the prophecy, He says that they should pray that their flight (escape) is not in winter or on the Sabbath day for then shall be great tribulation. This phrase “great tribulation” is NOT The Great Tribulation which is a specific event lasting 3 ½ years; it is a general description of a potential time after the Abomination…and I can absolutely prove it! It is right there in these verses if you would care to see it. He said “pray” that your flight is not in winter “FOR THEN” shall be great tribulation. The Great Tribulation is not dependent upon prayer or the weather! The Great Tribulation is a specific event lasting 3 ½ years and is absolutely set to start in the middle of the seven years. The duration of the Great Tribulation is described in Revelation 13:5, Daniel 12:7, Revelation 11:2, and Daniel 7:25. Do you see that this time, mentioned in Matthew 24:20, 21, of great tribulation for the Jews can be moved or even eliminated with prayer? But The Great Tribulation cannot; it is set in God’s Eternal Word as an absolute event that must happen. Therefore, this passage is not talking about The Great Tribulation but about a general description of a time after the Abomination that can be eliminated by prayer. 2 Thessalonians 2:3-4 KJV (3) Let no man deceive you by any means: for that day shall not come, except there come a falling away first, and that man of sin be revealed, the son of perdition; (4) Who opposeth and exalteth himself above all that is called God, or that is worshipped; so that he as God sitteth in the temple of God, shewing himself that he is God. There will not be a revealing of who the antichrist is until he goes into the temple and proclaims he is God. This happens at the end of the seven years which is the Abomination of Desolation. If he did it at the middle of the seven years, everyone would know who he is for the last 3 ½ years. If everyone knows he is the antichrist, how could he get anything accomplished? He couldn’t! No one would follow him or give him power knowing he is the antichrist. No one will be deceived by him if they know he is the antichrist. The devil does not want him revealed. But that is what 2 Thessalonians is saying will happen; when he does the Abomination and claims to be God in the temple, all eyes will be opened, all deception will fall to the ground like a curtain. Everyone will know he is the one and then Jesus comes back to destroy him for his blasphemy. Matthew 24:30-31 KJV And then shall appear the sign of the Son of man in heaven: and then shall all the tribes of the earth mourn, and they shall see the Son of man coming in the clouds of heaven with power and great glory. (31) And he shall send his angels with a great sound of a trumpet, and they shall gather together his elect from the four winds, from one end of heaven to the other. Jesus will rapture His people and destroy the antichrist and the armies of Armageddon personally. See the charts here for a visual. I know this scenario is hard to accept at first, particularly if you have been taught end-time sequences of events by most eschatology teachers rather than seeing it in the Bible for yourself. But I strongly urge you to reexamine Daniel 12:11 and see where it fits in your end-time scenario. What happens at the end of the 1290 days in your scenario? Do not take my word for it; I strongly suggest you ask the Lord what Daniel 12:11 means.